Deep lowland lake describes the depth and location of the lake in a watershed. These variables affect the lakes response to watershed variables. 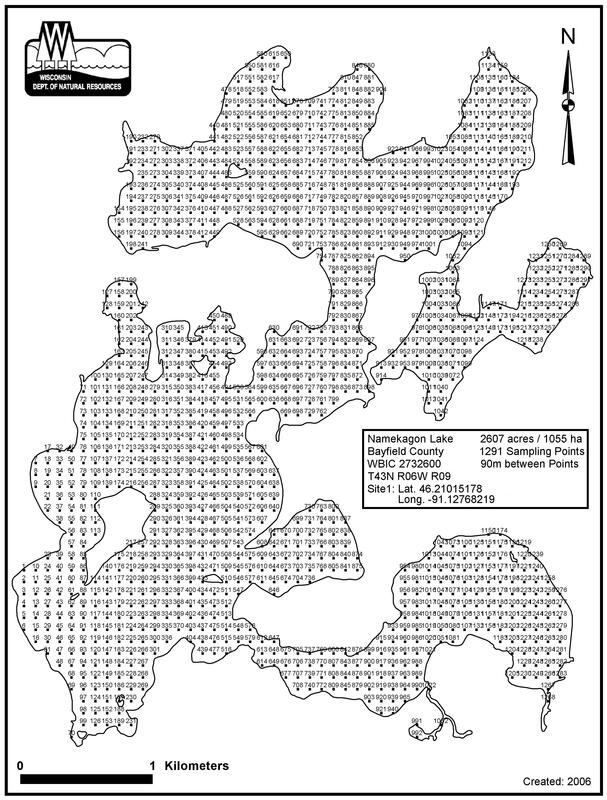 Namekagon Lake, in the Upper Namekagon River Watershed, is a 2,896.94 acre lake that falls in Bayfield County. This lake is an outstanding/exceptional resource water under NR102 under the Fisheries Program. This lake is managed for fishing and swimming and is currently considered impaired. management plan would be an asset for this waterbody. Namekagon Lake (WBIC 2732600) was placed on the impaired waters list for total phosphorus in 2014 as a Two-Story Fishery Lake. Subsequently the lake has been reclassified by fisheries biologists as a Deep Lowland Lake, not Two-Story Fishery. This changed the TP criteria used. This lake was assessed during the 2018 listing cycle; new total phosphorus and chlorophyll-a sample data were clearly below the 2018 WisCALM listing thresholds for the Recreation use and the Fish and Aquatic Life use. This water was meeting these designated uses and was not considered impaired. Namekagon Lake (2732600) was placed on the impaired waters list for total phosphorus in 2014. The 2016 assessments showed continued impairment by phosphorus; total phosphorus sample data exceed 2016 WisCALM listing thresholds for the Recreation use and Fish and Aquatic Life use, however chlorophyll data do not exceed REC or FAL thresholds. Based on the most updated information, no change in existing impaired waters listing is needed. Lake Namekagon association in the process of applying for a Lakes Planning Grant monitoring study and initiating the lake management planning process. Because of the ORW nomination status of this lake and the perception of degrading water quality, this lake should be accorded a high priority for selection as a Priority Lakes project. 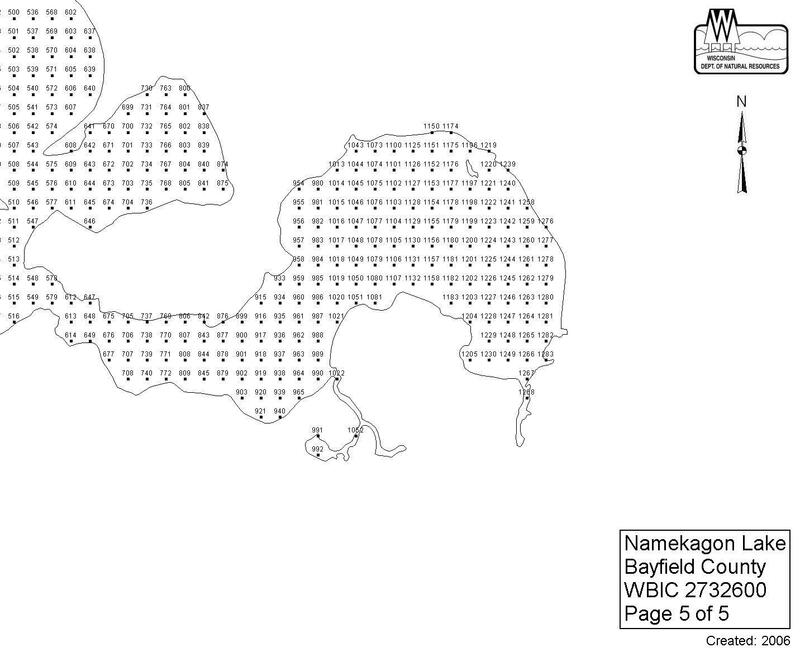 Namekagon Lake is located in the Upper Namekagon River watershed which is 197.80 mi². Land use in the watershed is primarily forest (74.10%), wetland (16.70%) and a mix of open (4.60%) and other uses (4.70%). This watershed has 135.34 stream miles, 6,298.06 lake acres and 19,026.69 wetland acres. This watershed is ranked Not Ranked for runoff impacts on streams, Not Ranked for runoff impacts on lakes and Low for runoff impacts on groundwater and therefore has an overall rank of Low. This value can be used in ranking the watershed or individual waterbodies for grant funding under state and county programs.This water is ranked High Lake for individual Lakes based on runoff problems and the likelihood of success from project implementation. Namekagon Lake is considered a Deep Lowland under the state's Natural Community Determinations.